Within a barren soundscape of quietude, the beauty of its stillness is what captivated me the most. This stillness was compounded by the unpredictable unfolding of its rhythm. Upon first hearing, Beat Furrer’s exquisite Voicelessness, The Snow Has No Voice for solo piano seemed somewhat improvisatory, at least rhythmically. As I explored the limited recordings of the work available to me, one-by-one, I became more certain that the rhythms of the work were freely notated offering freedoms to the performer that revealed themselves in each interpretation. Furrer’s rhythmic notation is hyper-specific, to the point of near absurdity. How absurd you ask? Try tapping 12 equal beats in one hand while tapping 13 equal beats against it in the other. No cheating—they all have to be equal. The Chopin virtuosi brush this challenge off with the grace of a nocturne. But let’s up the ante by dividing each of those 12 or 13 beats in a variety of ways, such as triplets, quintuplets, halves, and quarters. I think Furrer went too far for our Chopin friends. Don’t worry, I’m going to go out on a limb here and suggest that it is humanly impossible. That’s a good thing. The work is fresh and new with each performance, adding its own quality of timelessness to the work. Computers could accomplish this task, but of course they would do it the same every time. The wonderful thing about attempting the impossible, is the attempts will always be different—thus they are never “correct”. I look at this notation as a compositional process for Furrer—a way of getting the ideas onto the page. I greatly appreciate having this available to me, as a performer. But in the end, the interpretation becomes largely based on proportional notation. Attempting to perform each line of music as temporally and proportionally equal to each other will yield very good results. Secondly, attempting to interpret the repetitions of each line the exact same way will help in achieving uniformity as well as giving the audience the opportunity to better appreciate the cycling and layering that is occurring in the piece. Another innovative aspect of the work is its use of staves—there is no grand staff. Like the conventional grand staff, two lines are combined each time. 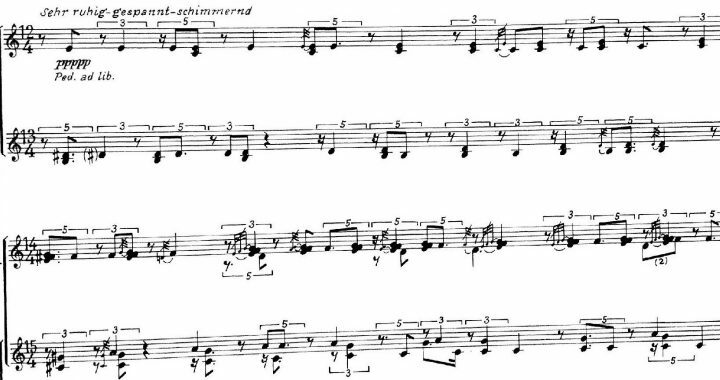 However, Furrer’s score asks that when the line is over, the bottom line becomes the top line while a new second line is introduced in its place. This cycle continues for the entire piece with all-but-three of the lines ending up being repeated. To my knowledge, this is the only work that uses this notational treatment, which actually lends itself pretty well to the piano. It seems to me this is a format with potential to live on beyond this piece. The unfolding of the repetitions as they are introduced to new material adds more accessibility for the audience to appreciate its material and development. The challenge is awesome, but rewarding, which comes to a climax when performing three lines simultaneously. Take a look here at the snippet from the score and listen to my live recording below. This link is cued to start at the beginning of this 3-line passage. In parallel with the later music of Morton Feldman, the obsessive counting and attention to tone and nuance leads to an otherworldly musical atmosphere. Spaciousness and timelessness are ironically achieved amid the intense adherence to time. Here is the full live recording from the beginning. Happy Listening!